Will books go the way of papyrus scrolls—relics of another age kept in glass boxes? That’s a question weighing heavily on the minds of many as our world becomes progressively digitized. Even the most devoted bookworms are wondering if their objects of affection can survive the era of Kindles, eBooks and BuzzFeed listicles. In Gensler’s Houston office, a team of designers recently hypothesized that modern-day, plugged-in students may lack a relevant use for physical libraries on campus. However, our firm’s 2014 Education Design + Performance report showed the opposite to be true. According to the findings, students and others still crave human contact. They want to be around others. And this desire to work in a physical environment surrounded by other people is why they still see libraries as important places for studying and performing individual work. 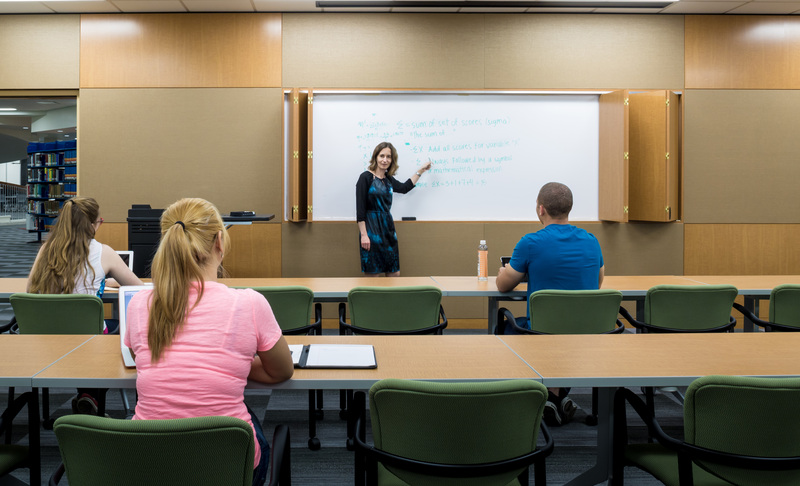 Within the competitive higher education arena, the quality and quantity of library space may be a key differentiator. In and around Texas, library space is in increasingly high demand and short supply. To counter this trend, school systems have decided to invest in their libraries, providing more focused study spaces, flexible furniture, up-to-date technology and consolidating their book supply. Consider the San Jacinto College Lee Davis Library, designed by a team from Gensler’s Houston office. Administrators at San Jacinto College wanted to position the Lee Davis Library as a center for student success rather than a repository for dusty hardbacks. They wanted the space to evolve so that it could provide students with needed support in addition to study materials. When our design team took on this project, we found many functional flaws in addition to a much needed shift in culture. The four-decade-old building no longer functioned well and was underutilized. The main public lobby on the west side had uncontrollable glare and heat gain. The entry points to the 58,000-square-foot structure did not comply to standards set by the Americans with Disabilities Act (ADA). The central stair did not meet life safety requirements and was wrapped in wire mesh for added protection. While the building required a major overhaul, our design team was sensitive to the historic significance of the building and understood that the client wanted to emphasize the social importance of learning. So we added several features that complement the building’s historic features while affirming the space’s role as a center of enrichment. New fritted glass on the west façade includes a graphic design pattern with all of the letters of the alphabet; it functions as a welcoming gesture towards the community. The free-flowing, unique graphic is also carefully detailed to reduce heat gain, while maintaining transparency. The interiors spaces are wide open; a wayfinding system of bold colors and super graphics signifies the locations of major functions. We brought the main staircase up to compliance while preserving the original details. It now reinforces the dynamic interior and encourages exploration of the building. We also restored the original Knoll and Herman Miller furniture. The new HVAC and electrical systems contribute to a sustainable building performance. All of this was accomplished within tight budget parameters, and the improvements to the library have yielded dramatic results. Library usage increased dramatically once the renovation was completed. The library now serves an important role for this growing community college within an economically challenged area. Another idea that many higher education systems now recognize is that libraries have their own rhythm. During the morning one space may be used mostly for quiet, individual study while later in the day the same space will host louder, group study and socializing. 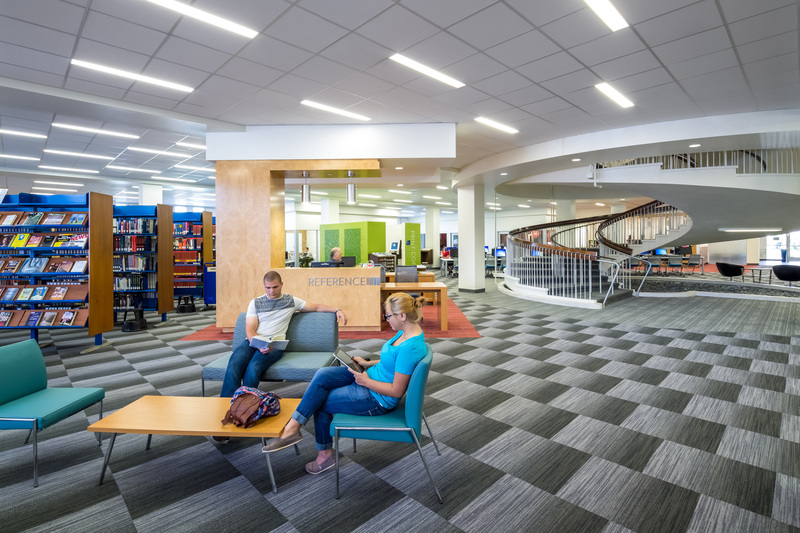 Many schools such as San Jacinto Community College South are renovating their libraries with the idea of activating all of the spaces throughout the day so that they are easily adaptable for multiple purposes. 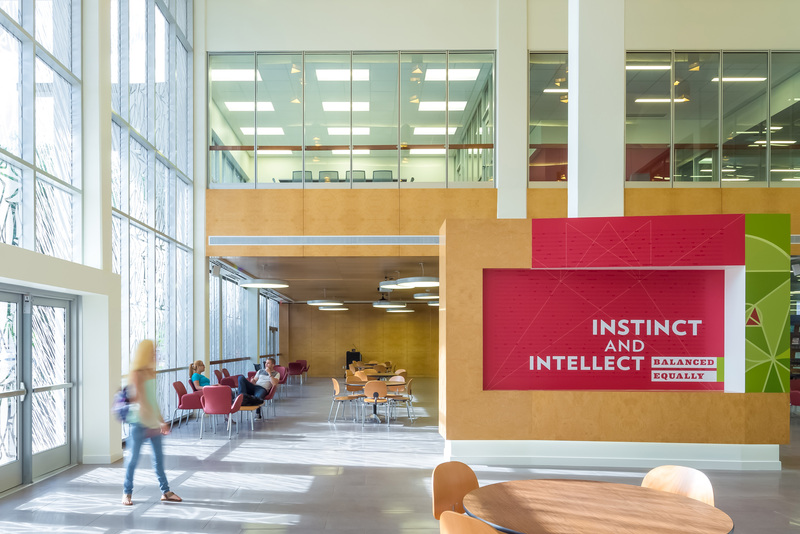 Gensler also recently completed the renovation of the school’s Parker Williams Library, and the idea of multi-purpose spaces helped guide the design. “In the end, we are going to be extremely happy. I must say, I love it! It lends itself to the movement of students,” said San Jacinto Community College Head Librarian Karen Blankenship, describing the new Parker Williams Library. Many schools in our region have libraries that are in need of renovation. One key to a successful renovation is understanding how space and resources are utilized and when. What time of day do the computers get the most use? What resources get checked out the most? Many libraries have found it necessary to reduce the number of books they display or store on-site to make way for more technology and collaboration space. Recently, the New York City Public Library made headlines by opting for an off-site book storage location and offering more e-books. However, I wonder if we can create a hybrid between traditional book-filled libraries and off-site book storage? Ask yourself, how flexible does a library need to be to make a place for people and their modern-day quest for knowledge? Kimberly Hickson is a leader in Gensler’s Education, Civic + Culture practice. 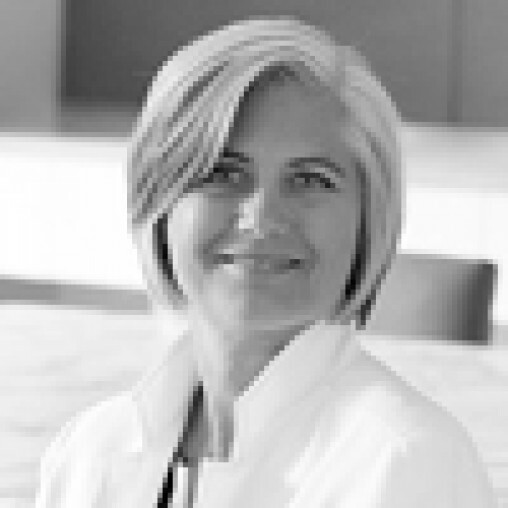 She was actively involved in the research team that created the study, “Academic Libraries at a Crossroads.” She was elevated to the AIA College of Fellows in 2010 for her leadership in sustainable design practices and her ability to successfully direct and manage complex higher education, biomedical, and government projects. She holds Master and Bachelor degrees in Architecture from the University of Kansas and a Bachelor of Fine Art in Interior Design from Iowa State University.